Amjad Khan, a teaching assistant in the economics department, said while TAs are not allowed to work more than 20 hours per week, their work load can vary based on the course. Faculty in the economics department say everyone is stretched thin as more students are taking economics courses. Updated: Feb. 11, 2016 at 12:04 p.m.
Economics professors say they need a little more help, and teaching assistants are feeling the pressure. Faculty in the department, which has seen a significant influx of students over the past few years, say there aren’t enough graduate teaching assistants to help conduct research, complete administrative tasks and teach discussion sections. The number of economics majors has increased 26 percent in the past five years, with 280 students now in the program and many more non-majors taking economics classes. TAs in the department said they feel strained and have more responsibilities than their peers in other departments, but are still paid the same amount. Anthony Yezer, an economics professor, said students have complained about not being able to register for classes that are full, and fill quickly – a problem he said could be remedied by having more TAs available to teach discussion sections in larger lectures. Yezer also said the strain on TAs could have broader consequences – students who have been accepted to the doctoral program sometimes choose to attend other universities because the workload is lighter and the pay is better. The 28 TAs currently employed by the economics department are paid an average of $22,500 per year. When The Hatchet last reported on the compensation of TAs in the economics department in 2012, former Provost Steven Lerman had recently raised the standard package to $20,000. TAs at peer schools like Emory, New York and Vanderbilt universities were being paid between $2,000 and $5,000 more at the time. Departments in the Columbian College of Arts and Sciences were hit with a hiring freeze in 2014 after graduate enrollment unexpectedly dropped, and some graduate students saw their financial aid shrink. Jeffrey Brand, the associate dean for graduate studies, credits TAs in the economics department with providing expertise and individualized help for students. Brand said that TAs are not permitted to work more than 20 hours per week and they receive salaries based on their weekly workload in addition to stipends and scholarships. “The number of graduate assistants in a department varies based on several factors, including course demand and the number of available graduate students,” Brand said in an email. Brand declined to say how many TAs the economics department or CCAS hired this year or over the past five years. Abilasha Sahay is a microeconomics TA for economics professor Irene Foster. Last semester, Sahay’s first, she had nearly 75 freshman across her several discussion sections. Sahay said her peers in other departments have far fewer responsibilities, although they are paid the same amount. She said that more compensation would be welcomed by TAs supporting themselves in D.C.
James Foster, a professor of economics and international affairs, said that more TAs would improve the economic department overall, creating more research opportunities. He also said the department currently does not have enough funding to offer scholarship and compensation packages to potential doctoral students. “The fact is that the total pool of money appears to be unable to attract the numbers that a department like economics, which is expanding the number of students at the undergraduate level, will need,” Foster said. 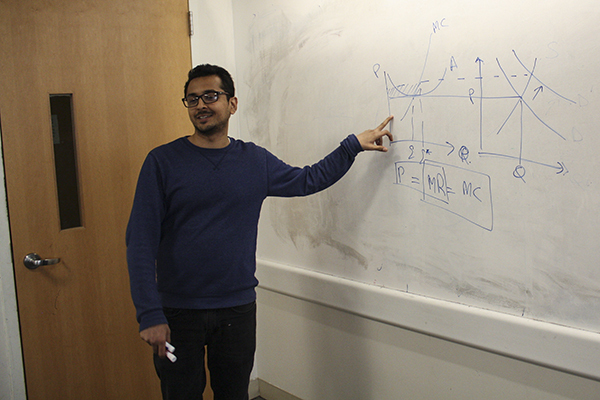 Amjad Khan, a TA in the economics department, said that while TAs are technically not permitted to work more than 20 hours per week, the TA workload varies for each course. Mark Connolly, a higher education expert at the University of Wisconsin, said department funds are the key factor in determining how many TAs they can have available for faculty. Connolly said that overworked or underpaid TAs can be detrimental to the quality of the class. The Hatchet incorrectly reported that Abilasha Sahay had 800 students in her discussion sections. She had 75 students in her discussion sections. About 800 students overall took economics professor Irene Foster’s course. We regret this error.